Many a times,no make that most of the times I am at a loss when we go to speciality non-veg restaurants and find myself staring at a menu loaded with non-veg dishes with a very small space dedicated to veg dishes.No prizes for guessing those dishes would be utterly boring.Usually,me and ma-in-law,the only vegetarians in the family stick to something safe-Pulao or Roti with side dish or such alternatives. I had this yummy Paneer Ghee roast at a restaurant in Bangalore named Abhimaani Vasathi which specializes in Mangalore cuisine.No visit to Bangalore is complete without a visit to this place.I've heard so much about the original-Chicken Ghee roast that I wanted to see how it actually tastes,the veg counterpart that is.Spicy and loaded with ghee,but tasty nevertheless. I wanted to recreate the recipe myself and came across this fabulous pictorial by Kudpi Raj on mangalorean.com.You could hop over there for the original recipe or scroll down for my modified recipe with Paneer. 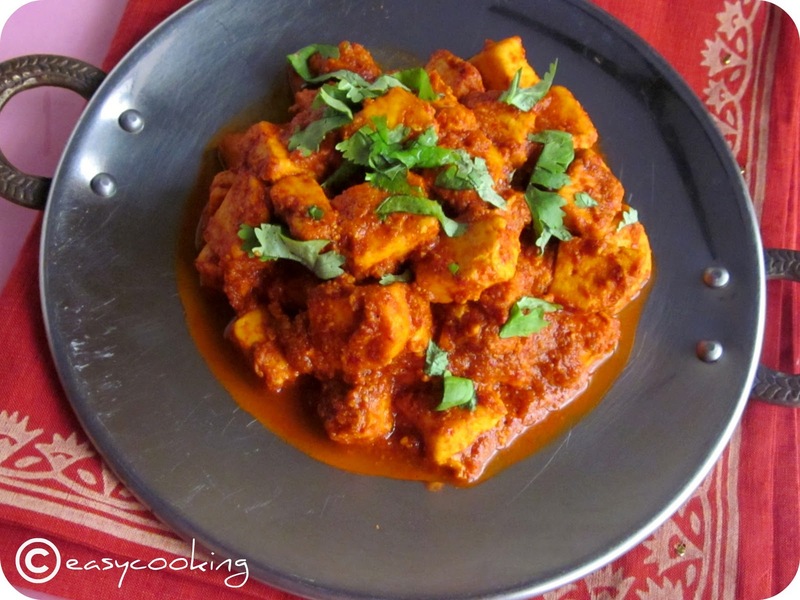 Chop paneer into small cubes. Mix all the ingredients mentioned under marinade and tip in the cubed paneer.Mix well so that the paneer cubes are coated well with the marinade.Keep aside for 1-2 hrs. In a kadai,roast together the ingredients for the masala for about 5 minutes.Grind to a smooth paste adding enough water as required. Back to the kadai-add 1 tbsp ghee and the ground masala.Saute till the masala starts leaving oil on the sides. Tip in the paneer and the remaining 1 tbsp ghee.Check for salt. Roast on simmer for about 10 minutes or till the paneer cubes are well coated with the masala. Garnish with freshly chopped coriander and serve hot. *Though I added the less hot Kashmiri Chillies,I was still left with very very spicy Ghee roast.So if you are heat-intolerant,reduce the chillies to 2 or 3. An interesting paneer dish,loved it. A big THX for the recipe... I have searched a lot for this recipe n cud not find one inspite of me stayin in mlore!! I bought a ready made powder but its not the same.. Urs looks just like d restaurant version..Too yummy!! Liked this version of paneer roast with a southindian flavor. superb looking divs....wanna try it soon..
hey this looks lovely .. bookmarked, even i'm one of them who love to make the veg couterparts of non-veg specialities. nice name,..must have been yum,. paneer and ghee...yumm!! too good!! Wow, a shahi treat. Paneer and that too ghee roast, must try it soon. I would forego the chicken for this yummy looking slternative. I imagine the chicken ghee roast! This one looks heavenly good! hi Divya, being a strict vegetarian, I too have confronted the same problem. love paneer a lot.I tried your recipe yesterday. but I added some fried onions too along with this. Hi Divya being a strict vegeterian, I too have always confronted the same problem. I love paneer in any form. Tried your recipe yesterday. Though i added fried onions also along with the masala. 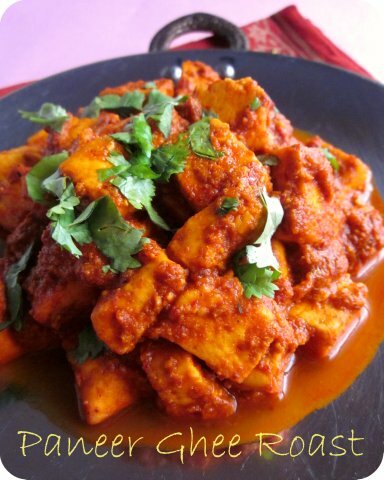 I have some paneer... and was going to make paneer butter masala... maybe I should make this instead.